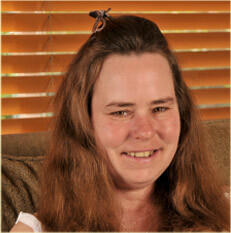 Teresa has lived at Randolph House, a PLACES Adult Care Facility, since 1998. She enjoys baseball, bowling and rock-and-roll music. At PLACES, every one of the individuals in the Residential Adult Care Facilities program is a success story. Meet a few of them: Teresa, Francesca, Wendell and James. Francesca had been a patient at the state mental hospital for decades before she was accepted into the Residential Adult Care Facilities program at PLACES. Even though some social workers worried that Francesca wouldn't do well outside an institutional setting because of her behaviors and accusations that stemmed from her mental illness, the staff at PLACES believed Francesca deserved a chance. Francesca has lived at PLACES for more than 10 years now. The few times hospitalization was necessary, her stays were short, and she was able to return to PLACES. Tolerance, respect and understanding by the staff have improved Francesca's quality of life greatly. She not only has made progress toward recovery but also is engaged in the community. The stability, structure and staff at PLACES have made all the difference. Some case managers and local group homes were unsure about Wendell, who had been homeless and living in a shelter for more than three years and had a felony in his past. But the staff members at PLACES were ready to help. PLACES welcomed him at Randolph House as soon as a vacancy opened up. Now that Wendell has been at PLACES, he is no longer quiet and withdrawn. He smiles and is becoming much more social. When he's around people, he seems happy. Instead of being exploited by the homeless community, he is getting positive attention from the staff and residents at PLACES – especially for his love of music and dancing. James, who has developmental disabilities as well as mental illness, had been hospitalized for a very long time. Although he was living in a local group home, he kept running away, which jeopardized his safety. As a result, he finally had to be hospitalized again. One day he was accepted for an opening at PLACES. The staff worked closely with James and his psychiatrist to convince him that running away was not safe, and that he had people at PLACES who cared about him. Over time, James gained trust in the PLACES staff and ran away less frequently. Finally, James stopped running away altogether. This positive change in his behavior earned James his own room and more responsibility. Today he even holds a job at Monco Enterprises.